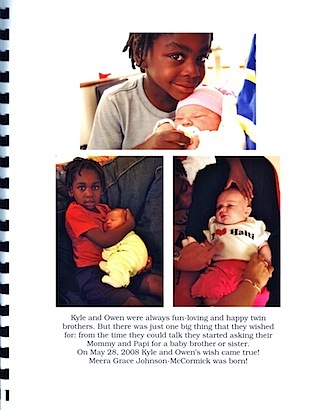 I made this book — a second edition (see post above) — and gave it to Kyle and Owen last year on our Adoption Day. 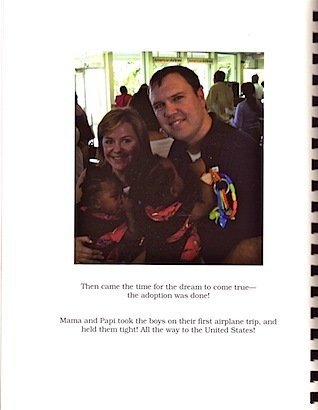 They were six years old, and it was our 6th Adoption Day. With this version, I basically took the exact text from the original book and just augmented it, fleshed it out, and turned it into a young-kid-appropriate book (updated from toddler-book). I also added more pictures to the original set. And, of course, Meera joins the family in this updated version too. To say that Kyle and Owen find value in this book is a huge understatement. It is probably one of their most valued possessions. Upon receiving it, they immediately wanted to bring it to school, which they did (on more than one occasion), and it really helped to tell their story, in an age-appropriate way, to their friends and teachers. 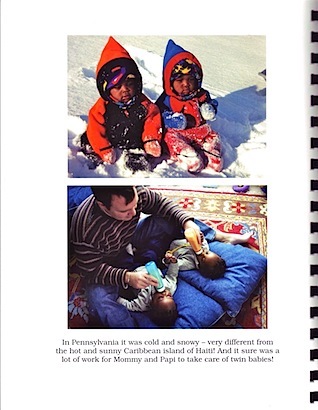 Over the past year they have regularly chosen this book off the shelf as their bedtime-story-book. Also, interestingly, they will often choose this as the book they want read to them at night by a babysitter. That is no coincidence — it is the perfect, easy way for them to make sure that their babysitters know their story. 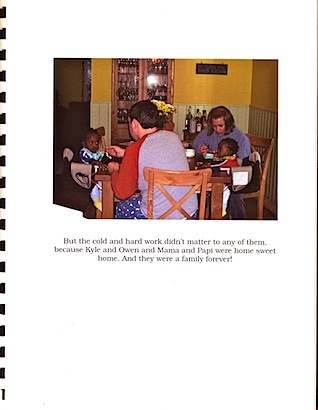 But the original book is still in active use too– they often will still ask to have the “baby book” read to them. They also can read the original book themselves– which they often will, out loud to Meera, or just on their own. These books are also extremely useful for, and important to, Meera. She knows our family’s story just as well as the boys did at her age. 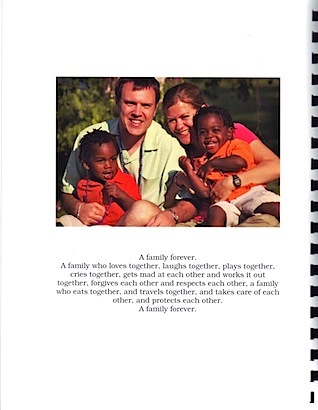 My plan is to keep doing updated versions of “A Family Forever,” every few years, continually adding detail, more photos, and layering on more complex information as they seem ready. 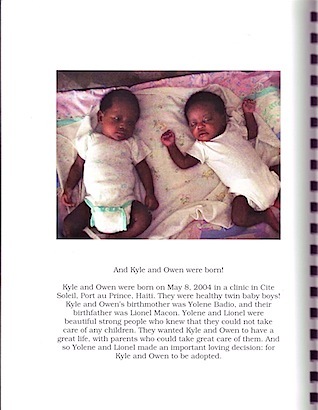 My hope is that by the time Kyle and Owen are 18 we’ll have five editions of the book. What a precious, precious gift to your kids! This is such a great idea! Thank you so much for sharing!! Another great edition, love this book and I can imagine Kyle and Owen (and Meera) are anxiously awaiting the following editions! Such a great gift – all the love and time you spent on this Heather is so evident. 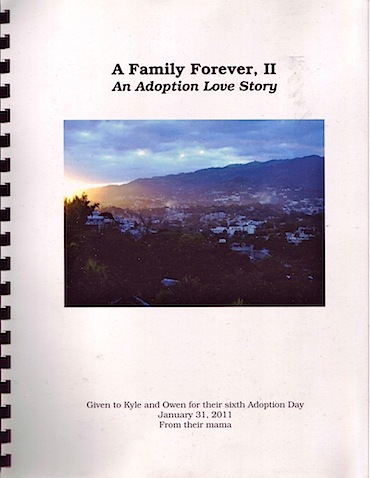 I’ll be thinking of you all celebrating your Adoption Day, I feel strangely connected to your family – my birthday is this Sunday, my Mum’s birthday is Tuesday and my Adoption Day is December 30th! Happy weekend all! Tears in my eyes again. 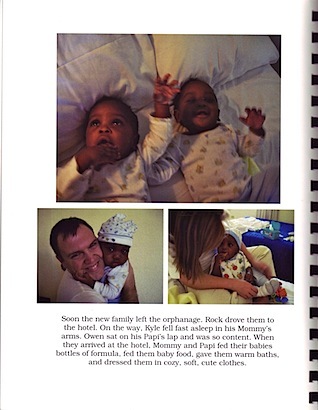 What a blessing the adoption of Kyle and Owen is for my life too. Thank you for adopting these precious boys. I love being their MorMor! Happy Adoption Day! Mor Mor is so right. What a blessinbg to be able to be part of their lives. It’s impossible to imagine life before K, O and Meera. With their faces on my screen every day starts out with a smile. I love this! Our son’s 2nd adoption day is coming up and we are totally going to steal this idea! Thank you sooooo much for the inspiration! 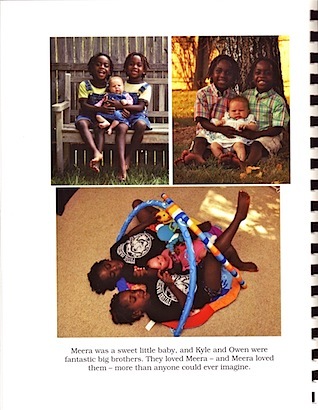 I think it is interesting that your boys choose to read their life story book with babysitters. As an adult I would think it would feel so private and personal, but my son also always wants to read it with visitors, and take it to school to share. 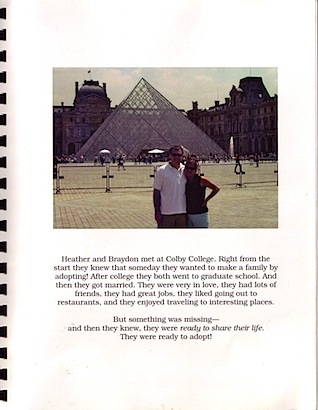 We have a second book documenting a reunion visit we were fortunate to enjoy last year. These books are some of my son’s most precious possessions. They really are so important, aren’t they? Thank you for sharing yours with us. Just beautiful. The waiting, the joy the commitment, the “becoming” are all there and reminds me of when my own baby boy forever and ever (now almost 17 years old!) came home from Russia. In particular, think you are so smart to do these at/for different developmental stages. I never thought of that! Also, I love how you ended each book “The beginning.” It is true. 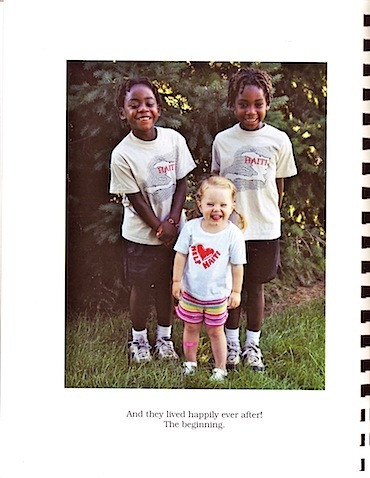 Our children’s adoption stories are not the sum of their story, but just the beginning. I have come to dislike the term “Lifebook” for this reason–at least for our family’s circumstances. I’ve been meaning to change the title page to read “A—-‘s Beginning Book”. I love this! 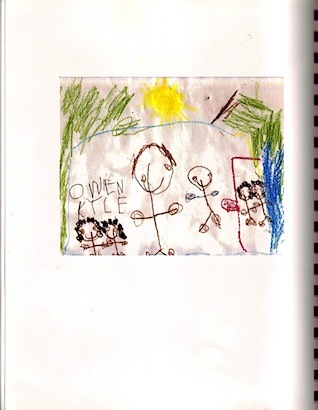 I want to make books for my children as well. 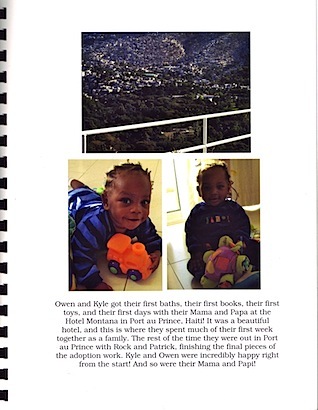 I know that this was posted a long time ago, but I have referred to it in recent days as I finally, on our 4th year celebrating “adoption day” (but we don’t call it that — we call it K—– day), made a book. And it was so hard to do and even now that it is printed and laminated I want to redo it. And redo it. 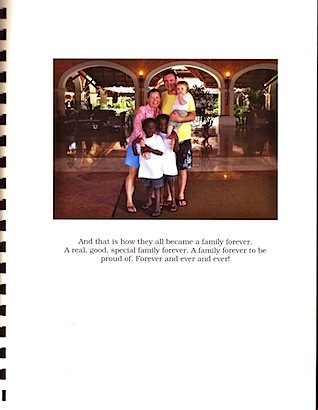 We have had a photo album and told the story and versions of it from the beginning, but I had been wanting to do a book for a long time. But putting into words a “story” when there is so little information is wrenching, and making a “book” and an official version of it brings all of this out. We do not have names of parents, a birth date, even a region. 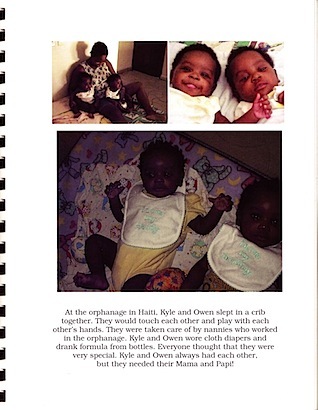 We have an estimated birth date and a day when my child entered the orphanage and of course the country of birth. Nothing else. 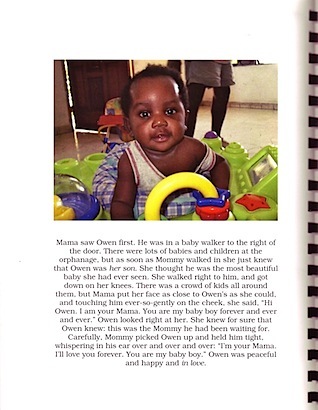 I read elsewhere about the importance of making the story about the child, not about us, our experience, our feelings, so I tried to do that, beginning with information about the country and general date of birth. I also felt very strongly that, no matter what pressures I felt, I wanted everything in it to be true. I did not want to make up things about the situation, about the birth parents, that I did not know, even if it made the painful (absent) facts better. 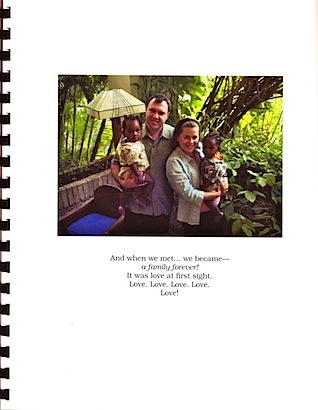 Like your version, I stressed the bonds of love and how everyone treasured the child at the orphanage, true and important things. Has anyone else out there had to deal with this–making a book when there is so little information? Thanks! !